Having enjoyed Ming Room's claypot rice dishes, we returned there to try out their dinner dishes. In addition to dishes that are often associated with Chinese cuisine, Ming Room serves a few unique dishes such as Cola Chicken that as its name suggests, uses cola in its cooking process. The dishes we ordered were Sizzling Japanese Tofu with Minced Pork, Sizzling Hot Plated Pepper Beef, Kung Po Chicken Delight and Siamese Crispy Pork. 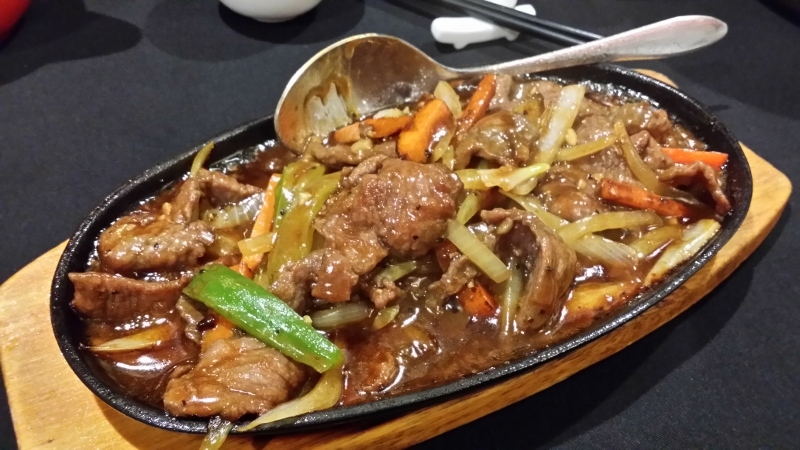 The beef in the Sizzling Hot Plated Pepper Beef was cooked just right and the onions, capsicums and celery gave it an extra element of texture. The chef's homemade pepper sauce helped to bring out the flavour of the dish and it came out piping hot, something we consider to be essential for hot plate dishes. 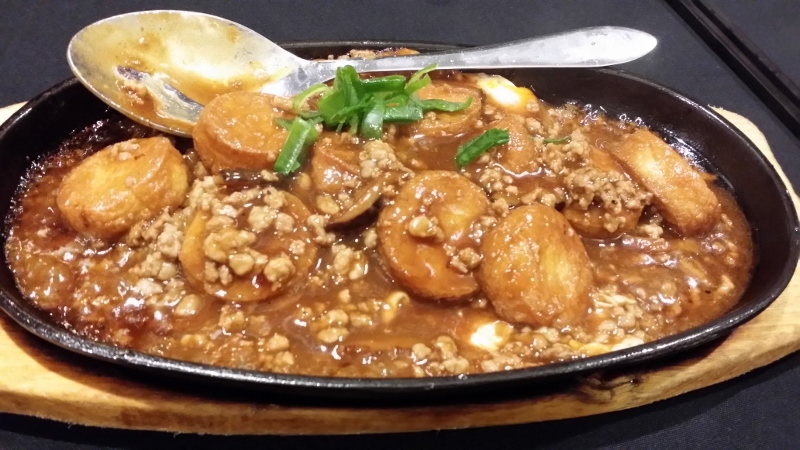 A dish that my sister enjoyed in Singapore and had been looking forward to, Sizzling Japanese Tofu with Minced Pork consisted of pieces of Japanese tofu stirred fried with minced pork and oyster sauce on a layer of fried eggs. The pieces of tofu and the egg were soft and their flavour was heightened by the minced pork and oyster sauce. Ming Room is the first restaurant that we have discovered with this dish on their menu. My sister gave the dish her stamp of approval, exclaiming that it tasted exactly the same as that in Singapore. Siamese Crispy Pork had slices of fried pork belly that were cooked to perfection with the garlic complementing it nicely. 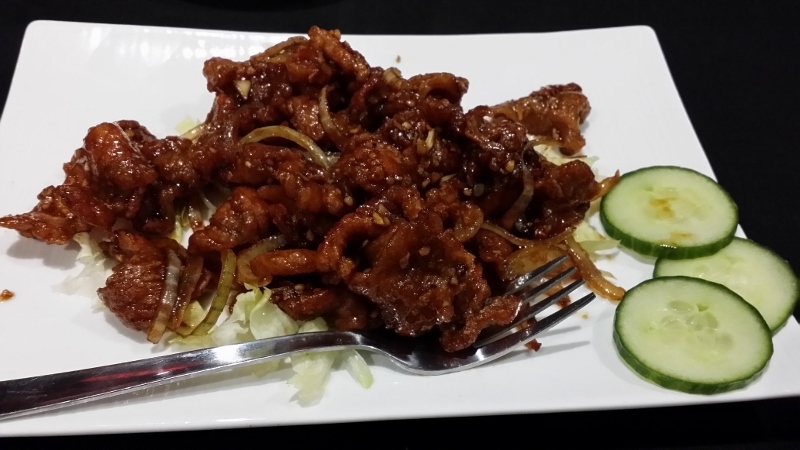 We were also able to taste a hint of shrimp paste that was likely used to marinate the pork belly. It comes served on a small bed of lettuce leaves that helped to offset the rich taste of the pork somewhat. The chicken used in the Kung Po Chicken Delight was tender and the slightly sticky Kung Po sauce lifted the flavour the chicken with a bit of heat from the dried chillies. It also had zucchini that was cooked to the correct doneness with an element of crunch from the cashew nuts. My parents said this dish had the same taste as that served in Szechuan restaurants in Singapore. 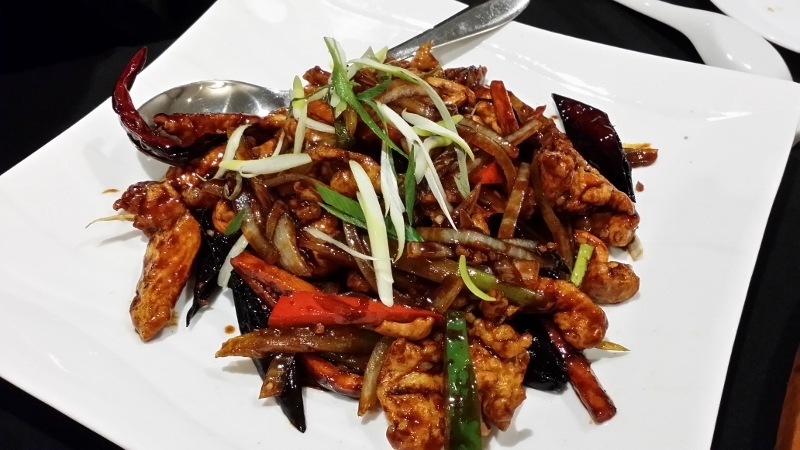 The Kung Po Chicken Delight dishes served at other restaurants lack the bold flavours of a Szechuan dish; most of them are just ordinary stir fried chicken dishes. Service at the restaurant was a bit slow but the delicious food and authentic taste of the dishes made it worth the wait. Ambience of the restaurant was very inviting and there is an area with two large round tables that is ideal for a small celebration party.